I’d experienced a fair range of cars from Alpina to Mazda Rx7 yet Porsche only happened 18 months ago when a friend claimed tiredness and asked me to drive back from Festival of Speed in his 911. Forty miles literally changed my life. Instantly I felt at one with the car, everything just felt ‘right’, instinctive and the flat 6 was quickly seeping into my blood. I did my research and jumped at a main dealer 911 4s. I insisted the test drive was with a ‘proper’ driver and they promised to send someone from the Porsche Experience Centre (PEC)… whatever that was…. The 2 hours with my own ‘Stig’ was the next life changing experience as I saw how a professional driver could control and handle the car even on public roads. I always had a strong belief that the car was more capable than me so I quickly booked in at the Porsche Experience Centre that led to a magical 12 month journey of regular track sessions at a variety of tracks from Silverstone to Goodwood, Castle Coombe, Blyton and even the Millbrook test track mainly in my own 911 but also tasting a GT3 and even GT3 RS. Each time I wanted to learn how I could get more out of the car and realised to get the most from these wonderful cars is a serious learning process. After investing more in tuition than the cost of 12 Pirelli tyres I heard the words that utterly shocked me…”for track driving you have outgrown the 4s”…I still felt ‘average’ but at least the investment in the weak link (me) had paid off ! I then started a real soul search to find the best track car…I saw the GT3 as the obvious choice, was enraptured by a GT3 RS for 3 short hours but felt that something was missing from these amazing point and shoot rocket ships. Ultimately I decided that their hidden wizardry may appear to make me the perfect driver but I would be fooling myself. Did PDK really mean you were a demon or was it better to learn true clutch control, heel and toe, rev matching, left foot braking, lift-off oversteer, trail braking, lane changing and skid control. Ultimately I wanted to know exactly what the car was doing and I was increasingly aware that ‘proper’ track driving took a toll on cars, especially tyres and brakes that were a league away from even aggressive road use. A couple of service bills from my friendly Official Porsche Centre certainly reinforced this point (not to mention the thought of GT3 insurance and repair bills for real track use). But how could I move this forward, the Cayman is ok but not really a serious option in standard format and would be a big drop from other Porsche track beasts. Maybe if I could tweak/improve the base car, change the high wear items and gain more feedback from an experienced track preparation and servicing team I could create an ultimate package that would achieve much more than a frenzied rocket ship launch control (though do try this in a GT3 RS at least once in your life). After meeting Greig and listening to their proven experience in Porsche road and track I felt brave enough to float my stupid idea. 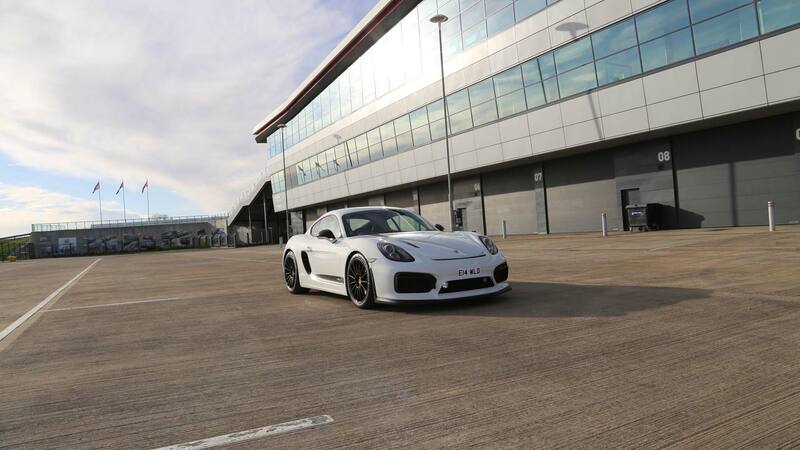 It was met with a grin and a ‘let me show you something’ that started with their Cayman GT4 ‘mule’ and then how they had a 3 year old Cayman S they had selected for just such a project…The Cayman CSR did exist…if I was prepared to be involved in its creation.. The easiest decision in the whole journey ! Kindly written by Chris Wildsmith…more to follow as this build evolves! Keep checking back for further updates.